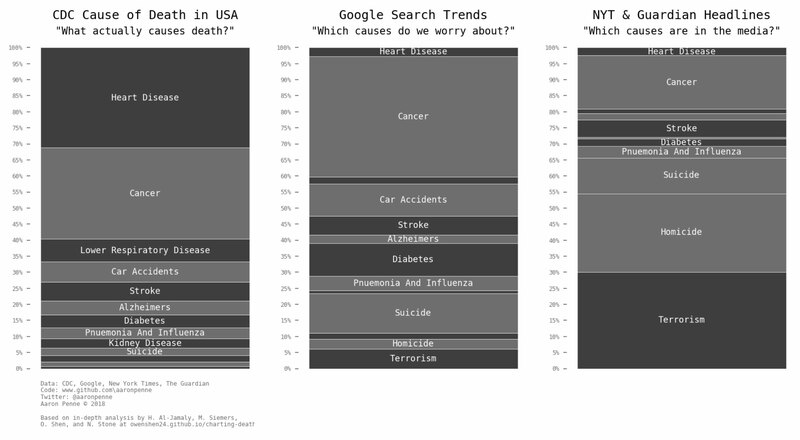 In a recent post on reddit, a group of students at UCSD published a series of fascinating charts comparing the actual causes of death in the United States versus what people searched on Google and what was discussed most in mainstream media. 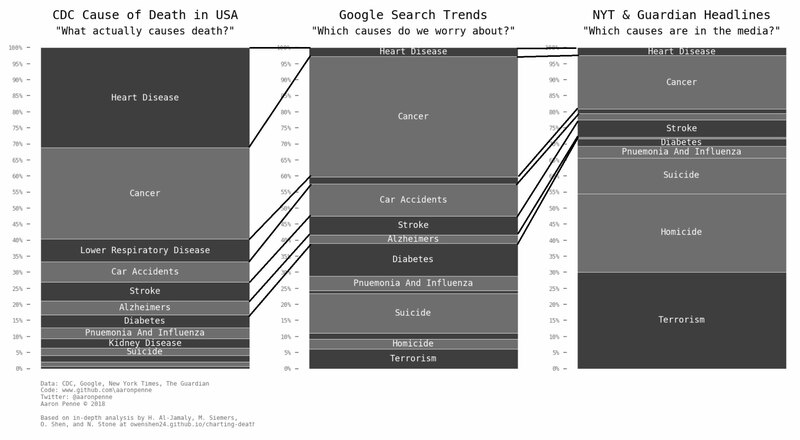 Using data from the CDC (199-2016), Google Trends search volume (2004-2016), The Guardian’s article database and The New York Times’ article database; authors Owen Shen, Hasan Al-Jamaly, Maximillian Siemers, and Nicole Stone created the charts seen below. The updated work was inspired by a 1979 study by Paul Slovic and Barbara Combs where they looked at how often different types of deaths were mentioned in the news. They then compared the frequency of news coverage with the actual frequency of people who died for each cause. All of the data and code used for the analysis has been made available on GitHub. You can also find a detailed write-up on the project here, where they discuss their methodology, statistical sins committed, and lessons learned. “For all of the above data, we looked at the top 10 largest causes of mortality, as well as terrorism, overdoses, and homicides, three other causes of death which we believe receive a lot of media attention.